Are the motor-powered pretensioners that start to retract the front seat belts when the CMBSTM, brake assist system, or VSA® system is in operation. They may also activate when you steer the vehicle hard, or the vehicle is impacted. 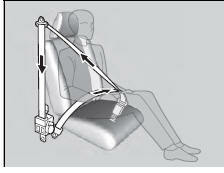 After retracted, the seat belts are slackened to their original positions. As convenient features, the e-pretensioners slightly retract the seat belts when you latch the seat belt buckle, depress the brake pedal more aggressively than you normally do, or make a sharp turn, and fully retract when you release the seat belt buckle. If only the e-pretensioners were activated, no components need to be replaced. The e-pretensioners may not work if: • Supplemental Restraint System Indicator is on. • Vehicle Stability Assist (VSA®) System Indicator is on.